Instant Pot Korean Beef and Rice - Let the Baking Begin! Instant Pot Korean Beef and Rice is perfect for a busy weeknight dinner. The notes of ginger and garlic give this tender beef recipe that Asian flavor flare that my family absolutely loves! Forget takeout and make this at home instead! I was babysitting my sister’s kids the other night. With 6 kids in my house, cooking an elaborate dinner was the last thing I wanted to do. Between deciding who had the toy first and who should be doing their homework, I knew it was the quick dinner kind of night. I had some beef in the fridge, so I decided to make this delicious, spicy Korean Beef Bowl. It’s like the easiest thing in the world. You toss the ingredients for the sauce, add the cubed beef, load up the pressure cooker and off it goes to do its thing. Lastly, you stir in the corn starch slurry and let it cook for another minute. If this ain’t easy, I don’t know what is! But, of course, the best thing is the flavor. The ginger, garlic and the slight kick from the Sriracha sauce, mmm..mmm…mm! Make this once and it will be on dinner rotation, regularly! Wanna know something crazy? I cooked both the rice and the Korean Beef in the same pot, at the same time! Yep, you heard that right! I bought these Stackable Insert Pans for reheating or cooking several things in the pressure cooker (Instant Pot ) at once. They come super handy for meals like these Korean Beef and Rice bowls I made today. All you do is set a trivet right over the beef, then fill one Insert Pan with rice and water, set it on top of the trivet and cook both the beef and rice together. My mom was over that day and I think I about blew her mind when I told her how I made everything. Before you get to the Korean Beef recipe itself, let’s talk about the cooking time for beef. 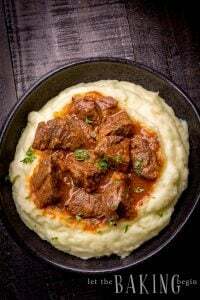 I have tested many beef recipes in the Instant Pot. After many trials, I can tell you not to experiment with any recipes telling you to cook beef for anything less than 30 minutes. The beef might no longer be pink after 15 minutes, but if we’re cooking beef chuck, there’s no way it will be cooked to its tender perfection in anything less than 30. In fact, if you cook it for 45 minutes, it is the best in my opinion. There you have it! Now you have all the info you need to make the best Korean Beef, at the comfort of your own home, with only 10 minutes of your precious hands-on time! 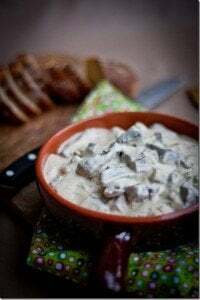 if you’ve made this recipe and love it, or don’t, let me know in the comment section! 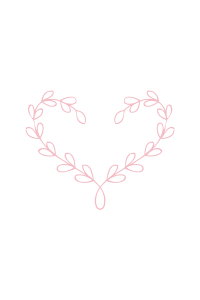 I love to hear your feedback! 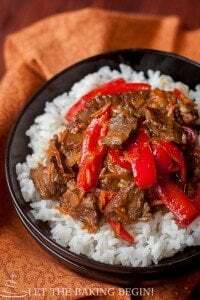 Instant Pot Korean Beef and Rice is made by tossing all ingredients for the sauce together, then adding the cubed beef and cooking together in an Instant Pot until soft. This Asian style beef recipe is perfect for a busy weeknight dinner when all you want is eat, not fuss over the stove. Add all ingredients for the Korean Beef Sauce to a 6 qt Instant Pot (pressure cooker) and whisk until combined. Add the cubed beef and stir. Cover with lid and set the pressure release valve to "SEALING". Cook on "Manual", "High" pressure and set the timer to 30 min. Once the timer goes off, turn the pressure cooker off and allow the pressure to be released naturally for about 15 minutes, then turn the pressure release valve to "venting". Once the pot is depressurized, open the lid. Combine the ingredients for the cornstarch slurry in a small bowl, then pour into the cooked beef and quickly stir. Turn the Instant Pot to "Saute" on "High" setting and allow to cook for 2-3 minutes or until the sauce is thickened. Serve over rice, rice noodles, quinoa, or mashed potatoes. 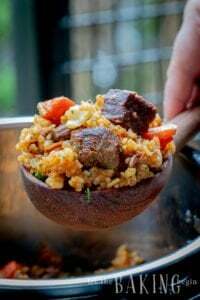 For this amount of beef, you will need to cook about 2 cups of grains (rice or quinoa). Garnish with green onions and sesame seeds, if desired. Fill a stainless steel pan like this one with 2 cups rice, 3 1/3 cups boiling water or broth, and 1 tsp salt. 15 minutes into cooking time (for beef), turn the pressure release valve to "venting" and allow the pressure to be released. Then open the lid. Place a trivet like this one over the beef. Set the prepared pot with rice and water on top. Close the lid, set the pressure release to "sealing", then pressure cook on "High" pressure for the remaining 15 minutes, followed by NPR (Natural Pressure Release) for another 15 minutes. After 15 minutes, turn the pressure release valve to "venting" allow to depressurize, and open the lid. Remove the pot with the rice and fluff with the fork, cover with lid to keep warm. Remove the trivet. Combine the starch and water with a whisk, add into the beef, stir and cook for 2-3 minutes until thickened. Serve by spooning the beef over the rice. This was so good! I traded the soy sauce for coconut amino, skipped the slurry and it turned out just how I hoped! Thanks! That’s awesome! Thank you for your feedback! I have thin sliced beef round ( like for carne asada) would that work? How long wuld I cook? I haven’t tried it with thinly sliced beef, but I would guess that about 15 min is enough. After that, taste it and see if it needs more time. Thank you for the recipe Marina! This recipe is definitely a keeper! First time making Korean beef, and so glad I tried your recipe! Delicious!! That’s awesome! Thank you for your feedback and the star rating! Thank you for another lovely recipe! 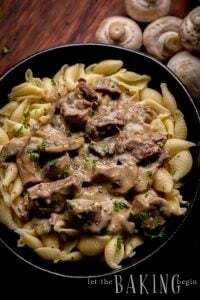 Do you know of the tweaks that need to be made for those who don’t have an instant pot and are still using their slow cooker or cast iron pot ?